If you have been looking at electric toothbrushes it is quite possible you may have come across brushes from Oral-B which include a SmartGuide. You may have found it difficult to really understand what a wireless smart guide is and what it does, there is not a great amount of detailed content on this accessory. Let us help take some of the mystery away and explain what it is. What is a Wireless SmartGuide? The smartguide is a compact digital unit powered by 2 x AAA batteries that has been designed to placed in your bathroom. It is essentially a visual tutor that encourages and guides you to do a better job when it comes to cleaning your teeth. 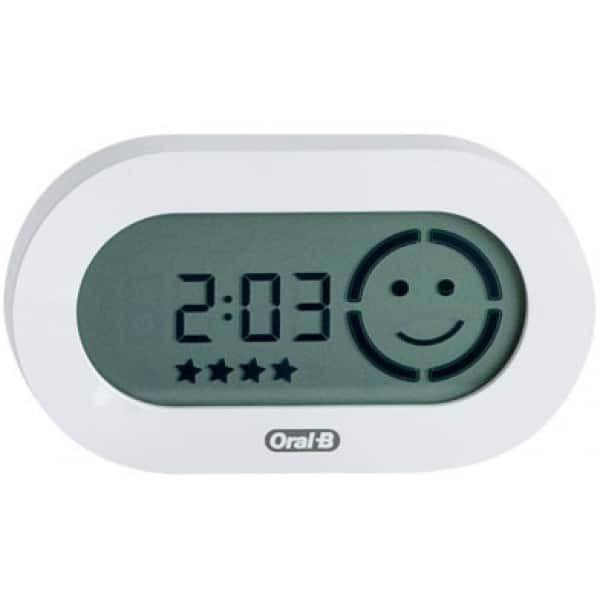 Acting as as a clock when not in use; but when you switch on one of Oral-B’s Bluetooth enabled brushes (no complicated pairing process required), the display is triggered and shows a timer and visual indicator. It provides real time feedback to you as you use the brush. This timer counts up, how long you have been brushing your teeth for whilst showing what quadrant of the mouth you should be in. It will also show the cleaning mode you are on via a symbol at the top of the display. The principle behind it is to be a tool to you as you clean your teeth, to do so for the correct amount of time in total whilst spending the correct time on each quadrant and generally cleaning your teeth better. A face appears within the quadrant guide with either a smile or a sad face depending on your performance. Brush too hard and you get a sad face. Brush for 2 minutes get a happy face. As you complete each quadrant a star appears at the bottom of the display. When all 4 quadrants are complete, 4 stars show. Oral-B demonstrate and explain this themselves in their very own video below. There have been 2 different versions of the Smart Guide developed by Oral-B over time. They work in a similar way and achieve a similar result, but the current model is more compact and reliable. It is this newer more compact variant that we refer to throughout this article. It is available in both White and Silver colour options. It is our understanding that there are different variants of the 3742. Each has slightly different part codes, the latter being labelled with a ‘B’ on the plastic ridge between the 2 battery slots under the back cover. The older, larger variant has part code: 3741 and looks as per the image below. This was supplied with what would now be considered my older Oral-B brushes that are no longer produced or sold. This 3741 variant does not work with newer brushes. At the time of writing the brushes that come supplied with or work with a wireless smartguide are. Not all SmartGuide compatible brushes come with a guide included in the box, in fact none of the new 2017 models do. But, despite not coming with a Smart Guide in the box, the Bluetooth compatible models work with the latest 3472 variant of the SmartGuide*. What are the brushes you can use with the Smart Guide? If your electric toothbrush does not come with a Wireless SmartGuide, but you would like one, the good news is you can buy one as a separate accessory. The White Smart Guide will cost £20 and can be bought here, whilst the Silver one costs £25 and can be purchased here. Whilst you need a compatible brush, if more than one person in the household has a brush you can actually programme the smartguide to work with up to 2 different brush handles. To do so, follows these steps. Push the «h/min» button in the battery compartment for at least 3 seconds. When SmartGuide shows «L—», turn on your brush handle to start the synchronisation process. When finished the SmartGuide will show «L-1-» on the display. Turn off the handle. To assign a second handle to the same SmartGuide turn on the other handle until «L-2-» is displayed. After having synchronized the second handle, «Full» will be displayed. Exit the synchronization mode by pressing the «h/min» or «set» button, otherwise it will end automatically after 30 seconds. If you have any questions or queries about the Smart Guide and how it works, just leave a comment below and we will gladly help. *Please note: Every effort is made to ensure the information provided is correct. Electric Teeth cannot guarantee compatibility. I have just bought the 6500 and it comes with the smart guide. I don’t seem to be able to par the two devices. I have followed the instructions (wait for L to appear etc) but it doesn’t show anything just the time.) eg when I change modes it doesn’t show on the screen. Any clue what I’m doing wrong? So, if you turn the brush on there is no timer shown, it just remains as a clock? Seems daft, but have you tried taking the batteries out, leaving it for a few minutes and replacing them, before trying again. Have you paired the brush to a smartphone as of yet? Thank you! I’ve been going to and from my new Oral B 6500 all week, trying to work out what the heck this clock thing is for… the instruction manual is utter pants! Just wanted to thank Jon for the info in this post! I have just successfully linked my new Genius 9000 handle to a new 3742 smart guide that I purchased from a supplier in Australia. Link to the 3742 below for others in Oz! Thanks Blake, great to hear you have got it working and are happy! I bought the new Oral-B Genius 10000N (Midnight black), but I don’t like the smartphone app. Does the Smartguide (silver or white version) work with my toothbrush? Thanks for the comment. Yes as far as I know version 3742 will work with the Genius 10,000N. Just make sure it is the version with ‘B’ stamped on the ridge between the battery slots. The Smart 6 cannot connect to a Smart Guide unless it is part 3742B. The B relates to Bluetooth, the connection used to pair the brush and the guide. Your smart guide 3742A will not work as it cannot communicate with the Smart 6 toothbrush. We’ve had an Oral-B Triumph for many years. The smartguide it came with stopped working so I found one on E-Bay (advertised as “new,” and it’s a model 3741) and bought it. Now I’m trying to sync it with our Triumph and it doesn’t seem to be working. The smartguide will correctly go into sync mode (showing “L – – “) but when I turn on the brush it won’t connect. Any advice? Ahh things like this are frustrating and I would love to say I had an answer that would work without fail. Presumably the old (not working) smart guide has been disposed of. Therefore the Triumph is unable to see the old smart guide to even try and make a connection. If you haven’t gotten rid of it yet, make sure you take the batteries out. I am not sure whether the ‘new’ smart guide came with batteries in or not or whether even if is was claimed as new it had ever been used. Therefore would try fully charging the Triumph toothbrush, remove the batteries from the new smart guide as to in theory erase any previous connections. Pop the batteries back into the new smart guide, set the time and then try the pairing process again. I am afraid if this does not work, I am not sure what the solution is. Could try Oral-B customer support, but given the age of the brush I am not sure they will be much help. Mine did that as well, syncing Pro 9000. I sorted it by syncing it twice . One with L — and again showing as L-2 and showing full. My toothbrush was working fine and syncing correctly for a good 10 months. But since I’ve moved into a new house, my smart guide won’t sync with mine anymore and has started syncing with my housemates one instead! I’ve tried to re-sync with mine holding down the h/min button and then switching it on but it’s not picking mine up. Any ideas?? It is a little odd that is should suddenly pick up your housemates and forget yours! My only suggestion would be to pull the batteries out for a while, replace them and then try and sync the brush and timer together. If you follow the steps outlined in the article, hopefully you can pair both. Out of interest, what toothbrush are you using? Is it a Bluetooth enabled brush? I have an Oral B Triumph 5000 with wireless Smart Guide toothbrush. I got it as a present for about 2 – 3 years ago but I did not used it because at that time I had another toothbrush. Given the age of the brush there is little you can do. It will now be outside of the warranty period I suspect and could not be repaired or replaced. The best alternative I think you have is to perhaps buy a second hand smart guide (you will struggle to buy a brand new one) and see if that works with it. You will need model number 3741. Hi my smart guide doesn’t show a smiley face anymore when brushing. I may have dropped it. How to reset? The timer shows but not the smiley face? Seems odd, but possible I suppose if dropped. No reset button. Just take the batteries out and give it a minute before replacing. Hi I have a type 3738 n2820 triumph 5000 I bought a second hand version 1 smart guide type ic 6856A-3741 but can not get the brush to pair. It’s definitely the older guide however the colour of the rubberised plastic on the back is grey and not the older light blue colour which is on the base of the brush. I hold the min button till L — comes up and then turn on the brush but it does not pair. I also have an old triumph 4000 which won’t pair with it either model type 3745 n2820. Any ideas? To be honest I am not sure what is going on here. Sounds like something is not working right. Could be the brush handle or it could be the timer. Sounds odd, but perhaps sit the brush on the charging stand and then take it off right before the pairing process and see if that works. You could always try contacting Oral-B to see if they can give any extra insight. I just got an Oral B 7000 that includes a smart guide. When I’m using the brush it’s bluetooth enables, and I see the timer. 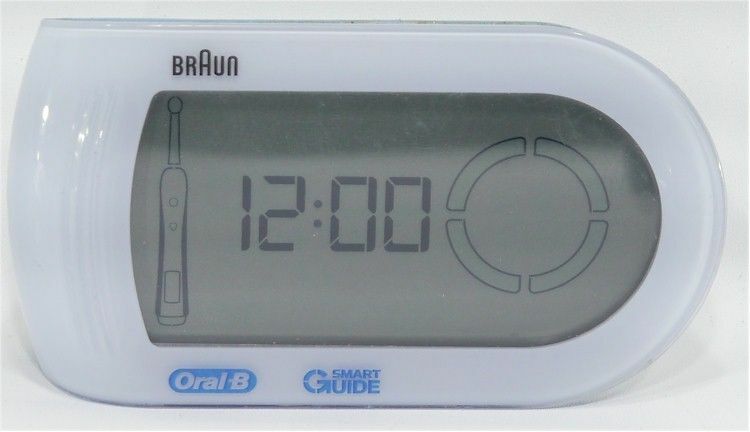 When the toothbrush is off the smart guide screen simply scrolls between what looks like the time (not at all the correct time),followed by a short timer displaying the various ‘feedback icons'(diamond, feather, tooth…) followed by the smile and the incorrect time again… I’m sure this should work differently! Thank you for any help you can give! I could be wrong, but this sounds like the demonstration mode. Does anyone actually have a type B smart guide? If so, what is the IC number? I believe I have the original Type 3472 with IC 6856A-3472 and my numbers in the ridge are 32731349RA – are those the similar ones for the B type? Where do I find the letter B? I have 2 x 3742 smart guides to hand, which I believe to be ‘Type B’. On the removable back panel, I have, on both, just like you 6856A-347. However on the ridge in between the batteries end with a B whereas yours ends with an A.
I am not sure that you have an option now. The newer brushes with the latest batteries are going to work with the newer Smart Guide. Presumably you had an Oral-B brush that did work with the guide. Perhaps best looking to source a replacement to that one, if at all possible. Thanks – discovered problem was Bluetooth turned off on handle – simple fix. I have an oral b 5000 – after being away for 11 days handle will not synchronize with clock – tried new batteries but still does not synchronize. Is your 5000 a version that has Bluetooth? If so, have you recently paired it to a smartphone app? If not, have you tried pairing the brush with the smart guide again? If anyone is struggling to get their Smart Guide 2.0 (type 3742) working with their Oral-B bluetooth enabled handle then check you have “Smart Guide Enabled” turned on in the Oral-B app. You can find the setting at the end of the “Toothbrush Handle” settings page. You will need to sync your handle with the app (by turning it on while the app is running) to get the settings updated on your handle. I hope this helps someone – I spent quite sometime trying to get my smart guide paired with no luck until I spotted this setting, it would appear that it is off by default for the Genius 9000 handle. Great advice Neil, thanks for this. The model supports bluetooth for phone app connectivity. However pairing with the Braun Oral-B D34 SmartGuide 2.0 Type 3742 does not work. Can you advice what to do? Are there any letters shown inside the battery cover of the Smart Guide. Others have commented that theirs have been labelled ‘A’ and ‘B’ is the one you need for it to work. I’ve bought one from shavers.co.uk and got the “A” model (I assume it’s a matter of luck, as you can’t really choose from their website). Complete waste of money, as I have the Smart 6 6000N brush which won’t pair with the SmartGuide I’ve got. Might be nice to update the article, to avoid others getting mislead. Ovi. Have you spoken to the team at shavers? They may well be able to resolve it for you. Given by the reviews, others have had success with that model. Yes, I’ve reached out to them, currently waiting to hear back. Will update you with the outcome. Got it sorted out with the help of the folks from shavers.co.uk. The “Enable SmartGuide” option in the mobile app was turned off. I can confirm the SmartGuide bought from them is working just fine. FWIW, the exact model I have is 6856A-3742. Bonus: there’s also an option in the mobile app to turn off vibrations every 30 seconds if you don’t like it. That is the correct smartguide for that brush. Have you already tried the pairing procedure by holding down the time button inside the smartguide untill the display changes and then turning toothbrush on? If this doesn’t work then I would think there may be something wrong with the smartguide. Hi, thanks for a really useful site. I have an older Oral B Triumph 9900 and lost the smart guide it came with. Trying to pair it with the 3741 Smartguide that came with a slightly newer Oral B Triumph 5000. Following your instructions I can pair the 5000, but not the 9900. It just doesn’t link when I turn it on. Any ideas? Thanks for the comment. I wonder if the Smart Guide with the Oral-B Triumph 9900 was slightly different to the one that came with the Triumph 5000 hence not pairing. I am afraid I have no other insight I can provide. Thanks Jon, you’re right. The 3741 model comes with blue back for the 9900 model and silver back for the 5000 triumph. I bought a blue one and it works perfectly. The older brushes won’t pair with the 2 newer style oval smartguides. Also the newest brushes with Bluetooth won’t pair with the 2 older smartguides (silver faced) only the white faced ones. Hi Noreen. Which toothbrush is it that you are trying to connect to the smart guide? If possible please provide more information on the smart guide you are using etc. The toothbrush is Oral b pro tri zone 5000 with wireless smart guide. OK so you bought this brush brand new with a smart guide included in the box and you are unable to get it to connect to it, is that correct? You mention you have another child and theirs is working. Do they have the same brush? Are the children brushing their teeth at the same time? I have a Smartguide from TZ5500 pack (year 2014-15?). Recently bought a Genius 9000, and I can´t get it to sync to Smartguide. According to Oral b support only older handles will sync to Smart guide. Thanks for the comment. Yes Oral-B do suggest this, but as you can see from this post and the comments on it, other users have gotten the Smart Guide working with their brushes. There are different versions of the Smart Guide. Can you confirm by looking at the section ‘Different versions of the SmartGuide’ of this article, which one you have? You will find the part code by removing the battery cover. I couldn’t get my first flat sided smartguide or my newer oval silver faced smartguide to sync with the new brushes but the newest white faced one I have would. Oral b said that the older smartguides (version A) won’t sync with the newer Bluetooth brushes but the newer one (version B) will as it’s the only one with Bluetooth technology. Luke. Sorry to hear you are having problems with these. First of all can you confirm what model of smart guide you have and where you bought it from? What’s happening when you try to pair? Anything on the displays etc. Cannot get my genius 9000 to work with the smart guide, Bluetooth on, done the L pair process with smart guide but nothing happens. Smart guide works fine with old 6500 brush. This is really odd given that most other have managed to get it working. Perhaps try resetting the Smart Guide by pulling out the batteries for a minute of two, then try again. Thanks for the advice, tried with a spare smart guide that has been off for over a year and neither our 9000 black or rose gold will pair. We have Four smart guides in the house two of each type (older and new version) and unfortunately none will work with the brushes, shame really as the app is a pain to use. I will keep trying and let you know if I find a fix. Hi Jon, turns out our smart guide is a code A (shown on the ridge in the battery compartment) and so is an older version not compatible with the genius 9000. Need a code B smart guide to work. Oh right. This is strange. I was not aware of different versions of the same smart guide. I guess you can get a new one from Shavers.co.uk as shown in the post. Disappointing that given you have 4 smart guides none work. Your experience will come as a help to others reading this article. What an awesome page, I couldn’t find anywhere how to ‘pair’ my old 5000 wireless smartguide with my new 9000 toothbrush that doesn’t come with one, that is until your very informative page about it. In practice with any Bluetooth device you do need to pair – but your steps on how to add another toothbrush are perfect – so just follow the steps you outlined with your old or new toothbrush and it will work which is brilliant! To Pair – ‘Push the «h/min» button in the battery compartment for at least 3 seconds. Thanks for the comment, but based on your comments, I think sadly the SmartGuide is broken and won’t work any more. There is nothing more you can do to my knowledge. You can buy new ones if you so desire. Wondering if you can you pair 2 toothbrushes with one wireless guide though? Have been sharing a toothbrush with my wife daily but the removal of heads is more cumbersome and not good for the head attachment longevity, thus 2 brushes with one smart guide seems a better combo. Based on your question I did a bit of testing. Using a Genius 9000 in Black and one in Rose Gold. The 2 Genius 9000 brushes worked with the Smart Guide, thus doing exactly what you desire. I did nothing other than switch the brush on. I presume the most likely scenario is you will use the brush and the guide followed by your wife, not at the same time. In this instance, it seems it will work. Now as you can probably appreciate they can’t both run at the same time and both show on the display. However, I stared the Black Genius 9000, let is run for 5 seconds, it showed on the Smart Guide, I then stopped it. At this point I turn on the Genius 9000 Rose Gold and it gets picked up by the Smart Guide and starts a new timer, not continuing from the 5 seconds on the clock from the Black. After 15 seconds, I turned the Rose Gold one off and the Black back on to see that the Smart Guide picked the handle up, but continued on from the 5 seconds it had reached previously! So, it would seem (although unlikely officially supported) that you can use 2 different brush handles with one Smart Guide. Thanks Jon for testing, much appreciated. I will leave the decision with you, but if you need any assistance, let me know. Olympic shaver company are the one to get your smart guide from. A quick phone call, number on the toothbrush, £28 and delivered in two days, couldn’t be better. Thank you everyone for your kind assistance. No problem David. Glad you got it sorted. Hi Jon, Many thanks, I will ring this company within the next few days and post further comments. This has been most helpful. Yes I am in the UK sorry about previous reply I have since looked uo the Olympic Co and found they are based in UK. Did you manage to get the suggested smart guide to work with the oral b genius 9000? Jenny, Not sure if Virginia did but we have had many others who have had success. I have recently bought 2 OralB Genius 8000-9000 one I black for my grandson and one in white for myself and I am wondering if I can buy a smart guide with a smiley face for them. For the price paid I feel that this this should be provided as it is with the cheaper model it is not always convenient to use my smart phone in bathrooms This is something you should urgently consider. I have read all the reviews and this is something that comes up all the time. I find the genius an excellent toothbrush is all other respects. Your comments please. Hi Virginia, Thanks for the comments. You are not the first to say or suggest this. As you say yourself the reviews say they should include it. Are you in the UK? We have had others who have purchased a Wireless Guide separately and had it working with their Genius brush. You should be able to ring Olympic Shaver Company on 0115 965 7440 and ask for the smart guide – Type 3742 & IC: 6856A-3742. Delivered in the UK it comes to £25.